LANSING — At Tuesday’s final scheduled meeting of 2017, the Michigan Strategic Fund board approved assistance to projects that will generate a total capital investment of $982.4 million and create 241 jobs.American Haval Motor Technology LLC is a subsidiary of Great Wall Motor Company Ltd., China’s largest manufacturer of SUVs. The company plans to establish a research and development center in Farmington Hills, investing $3.5 million and creating 150 jobs. As a result, the MSF board approved a $1.5 million Michigan Business Development Program performance-based grant to the company. Michigan was chosen over a competing site in Ohio. The city of Farmington Hills has offered to cover costs related to an environmental site assessment. Individuals interested in careers with American HAVAL Motor Technology should visit https://ahmt.easyapply.co/. Gov. Rick Snyder held meetings with executives from Great Wall Motor Co. during several of his trade missions to China, where he made the case that there is no better place in North America for Chinese companies to expand and create jobs than in Michigan. Also approved was $34.8 million in local and school tax capture to the Niles Brownfield Redevelopemnt Authority to fund brownfield remediation at the site of a proposed new natural gas power generation plant. Activities will include demolition, debris removal, site preparation, and infrastructure improvements. At the site, Indeck Niles LLC plans to build the Indeck Niles Energy Center, a 210,000-square-foot building that will generate more than 1,000 megawatts of electricity to Michigan and surrounding states. The project is expected to generate a total capital investment of $967 million and create 21 full-time equivalent jobs. The MSF board approved a plan to redevelop three parcels of property on North River Street in Ypsilanti’s Depot Town submitted by the Original and Only Thompson Block LLC and 3mission Redevelopment Corp. The project includes historic renovation and reconstruction of a damaged Civil War-era structure into a mixed-use development with restaurant and residential space. The project is expected to generate total capital investment of $11.8 million and create 70 full-time equivalent jobs. As a result, the MSF board approved a $3.175 million Michigan Community Revitalization Program performance-based loan participation. In addition, MSF approved $1,265,799 in local and school tax capture for the Washtenaw County Brownfield Redevelopment Authority to perform brownfield alleviation activities at the site. * An amendment to the Michigan Community Revitalization Program performance-based loan for the Diamond Place LLC project in downtown Grand Rapids. During construction, the developers discovered unforeseen costs associated with the excavation and preparation of the site. The amendment allows for $1 million to be added to the original $2.8 million grant that was approved in September 2016. The completed project will include 42 units of apartments and commercial space that will include a 16,000-square-foot neighborhood grocery store. The project is expected to generate a total capital investment of nearly $19.5 million and create 112 full-time equivalent jobs. * Authorization of private activity bond financing for two projects: $5.5 million for the expansion of the Huron Valley PACE facility in Ypsilanti; and $5.5 million for the refunding of bonds as well as $5.6 million in new money bonds for the Hope Network West Michigan, Hope/Spectrum Health CC, Hope Network Behavioral Health Services, and Alternative Community Living, Inc. projects. * An increase of the MSF $10 million loan award from the Investment Fund by $3.5 million for Michigan Community Capital to facilitate investment in “attainable housing” projects around the state. Attainable housing has been identified by MEDC staff and partners as an unmet need in many communities around the state as rental rates continue to rise, creating displacement of many residents away from the employment centers in those communities. Michigan Community Capital, formerly known as the Michigan Magnet Fund, will work with developers to invest in low and moderate income housing in specific communities around Michigan. * Approval of $3 million for the “Smaller Development Initiative” pilot project. The initiative will be marketed by Michigan Community Capital to developers with limited experience to put together housing projects in communities where a lack of investment is holding back growth. The Michigan Economic Development Corp. is the state’s marketing arm and lead advocate for business development, job awareness and community development with the focus on growing Michigan’s economy. 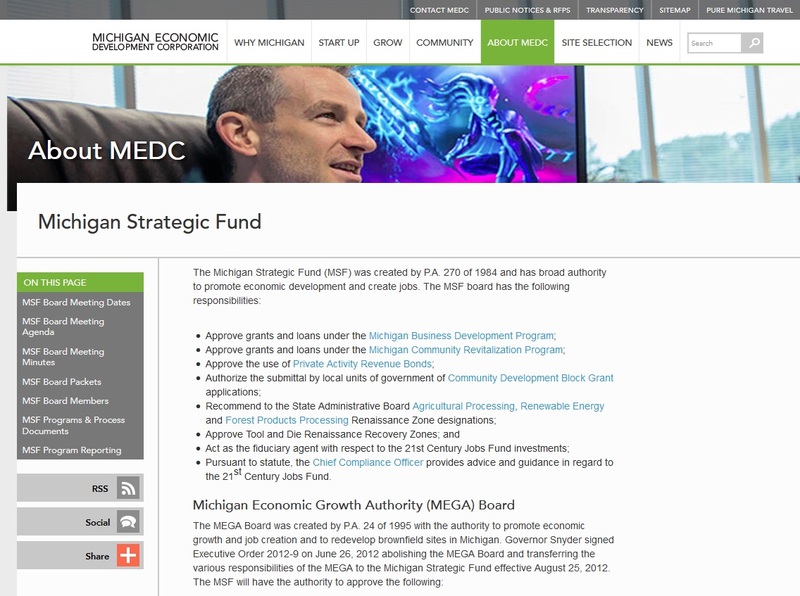 For more information on the MEDC and its initiatives, visit www.MichiganBusiness.org.